The initial year of our marriage was perfect. My wife and I were the envied couple, and everyone wanted to know the secret recipe of our marriage. Both of us were succeeding in our professional as well as personal lives. It was all cheesy 'love is in the air' kind of romance, and I could not have asked for anything more. But as they say, like all bad things, good things fade away too. As the time passed by, we started to deal with life's circumstances together. The reality of life hit us in the face, and no vacationing or traveling could make us escape it this time. Having arguments became our normal routine, and love was lost somewhere between our egos and power struggle. 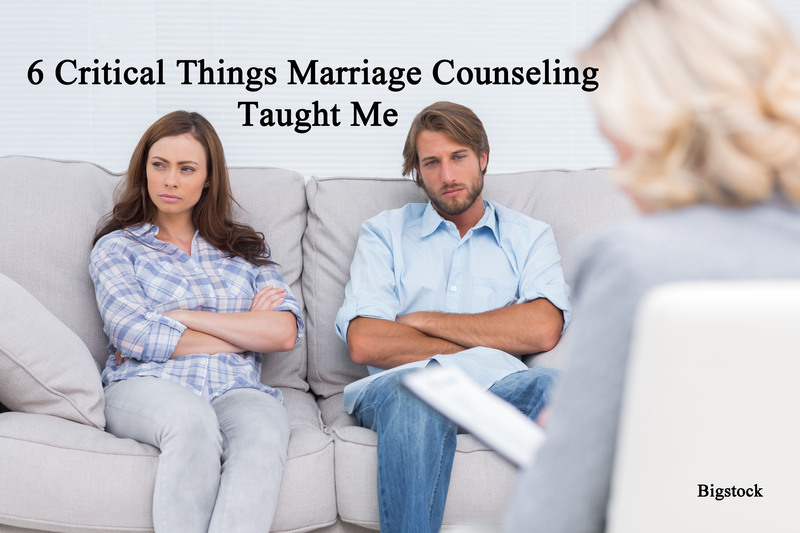 Before things could go from bad to worse, marriage counseling came into the equation. A professional outlook on our marriage helped us in getting the spark back in our relationship. It assisted us in dealing with our fears, expectations, anger and passive-aggressive behaviors that arise when the going gets tough. Here are the things I learned from marriage counseling that I was not aware of before, that helped me in sorting out my marriage. A trigger is something that is present in every individual. It is a preexisting condition, which sets off when someone says or does something. It is shaped from all the experiences you have had in your life - from childhood to adulthood. The reaction towards such triggers is uncontrollable. To form a stronger bond with your spouse, you should be aware of the "push-buttons" triggers that can elicit negative reactions. For example, if your spouse had an alcoholic parent, you getting drunk could be a trigger. There a lot of different types of trigger, we are unaware of. These include; resentment trigger, respect trigger, despair trigger, value trigger, and stagnation trigger that you should avoid at all costs. These bring back past memories and cause a negative emotional reaction. You may not be responsible for it, but you will surely bring back the repressed memories and feelings of your spouse. While your spouse has triggers. You too have ones. We all have repressed memories in our unconsciousness that creep up when they are triggered. Therefore, we should be aware of the things that upset or anger us. May be there is something about our spouse that we don't like, some habit of theirs that irritates us so much that it is a deal breaker in the relationship. It is important to communicate it to them gently, so that they can avoid it to keep the marriage intact. So before you figure your partner out, you need to know yourself. As the famous psychologist, Carl Jung said, "Everything that irritates us about others can lead us to an understanding of ourselves." In other words, our triggers are our teachers. Most of the time, our reaction to pain, fear, and hurt is anger. People mask their pain behind the façade of anger because it is easier to show rage than your vulnerable side. It is a defense mechanism that helps us in hiding our fears, weaknesses, embarrassments, and guilt. You need to learn to express your anger in a software and more vulnerable way to your partner. Anger fuels anger and further damage the marriage, but the expression of pain will really make your partner wonder what went wrong. My wife and I were becoming pros at the blame game. We made the other person responsible for not giving enough time, for prioritizing work before home, and the downfall of our marriage. What we did not know was that blame is a narcissistic excuse that makes one person feel better at the price of another's unhappiness. It is important to accept that none of us is perfect. So instead of criticizing your partner on every point for their lacking, try to be compassionate about it and let them know about things that bother you as constructive feedback in a calm manner. A relationship is not about winning, it is about understanding, which cannot be done through blaming. Instead of being reactive, when we choose to be proactive, we take up the responsibility of improving on our own rather than waiting around for our partner to change their behavior. We start to feel that it is our responsibility to bring a positive change in the relationship. When we understand that the change will come with our actions, we do not feel so helpless. This helps us in moving past all the blaming and stop holding each other responsible for our own lacking. This way, we set goals to built a stronger bond with our partner, rather than sitting and waiting for how things will end. Besides, it is important to note that when one partner change, it change the whole dynamics. Lastly, no matter how much criticism you receive from them or how many things they hold you responsible for, you don't need to sink down to their level. Be at your best because when one partner is reasonable, the other also makes efforts to improve. Besides, if you retaliate or react, you would suffer and be miserable. As Mark Twain wrote, "Anger is an acid that can do more harm to the vessel in which it is stored than to anything on which it is poured." It is normal for a collision to occur when two people with different personality traits and mindset are put together to spend the rest of their life together. But what comes out of that makes the marriage just right. As Harriet Lerner wrote, "Differences don't just threaten and divide us. They also inform, enrich and enliven us." Moshe Ratson (MBA, MS MFT, LMFT) is a Licensed Marriage Family Therapist in Midtown Manhattan in New York City.